I know I always keep raving about Hot Key Books releases (such as the incredible All of the Above by James Dawson, which I reviewed yesterday), but this novel was SO GOOD, you guys! When I saw it was marketed as similar to Veronica Mars I was very skeptical as I loved that show to pieces and I couldn't imagine how a book could replicate that quirky, cool mysteriousness, but guess what? It totally did! Despite the completely different characters and story I really did feel like I was returning to a place just as filled with murder, intrigue and an awesome lead gang as in Neptune. When Zoe moves with her mother from New York to a small town she knows this is only a temporary hiccup in her carefully planned route to getting into Princeton. She just has to survive a little while at the local high school, until she gets accepted into private school back in New York, which will guarantee her a spot at the university of her dreams. However, what she hadn't counted on when created this plan with her father was Phillip Digby. Zoe may be the protagonist of this novel, but it was the merry band of misfits that became her friends along the way that kept me completely hooked on this absolutely mad but also incredibly captivating adventure. Digby was of course the most intriguing of them all, with his own tortured backstory and mission to find out what happened to his sister all those years ago, but I also loved his on-again off-again friend Henry and the genius Felix, who may be quite a few years Zoe's junior but his sheer determination to make her go out with him was both endearing and inspiring. And then there was the story itself. Did I mention it was completely mad? Because it totally was! Yet it also made absolutely perfect sense in the end; I loved how Digby's bizarre missions and requests along the way slotted so neatly into his grand plan. Stephanie Tromly has really carefully crafted the bigger picture, throwing in plenty of hints yet leaving the reveal until the very end, and it was glorious when it all came together to make sense without at any stage being even remotely predictable. And it was such fun as well! Digby's methods were unconventional and at times perhaps a tad too near crazy town, but they worked and it was a joy to read about all his exciting ideas. 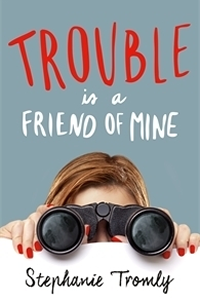 Trouble is a Friend of Mine is one of the best and maddest young adult novels I have ever had the joy to read. With a bunch of loveable, though unconventional main characters, and a solid mystery story at its core, this is the kind of trouble every wannabe-detective (or anyone, really), would want to be a part of. Many thanks to the publisher for a copy of the novel in exchange for an honest review!